Last December when I went to Tokyo, I discovered this BAKE Cheese Tart at Jiyugaoka. The queue was super long, I didn't have time and gave up eating it. Big regret and have been thinking about it ever since! So last month, when I went back to Tokyo again, die die must try! 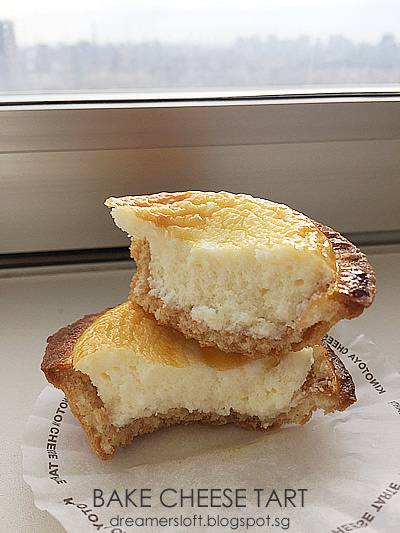 Read up about the background of BAKE Cheese Tart, it actually originated from Kinotoya Bakery in Sapporo, Hokkaido. After the success of the tarts in New Chitose Airport and Sapporo, more shops were opened in Tokyo and subsequently Osaka, Fukuoka and even Hong Kong! I heard that there's a similar cheese tart by Pablo, which is also highly raved about. I saw it in Tokyo but the tart is kind of big and difficult to eat/manage so I didn't try. 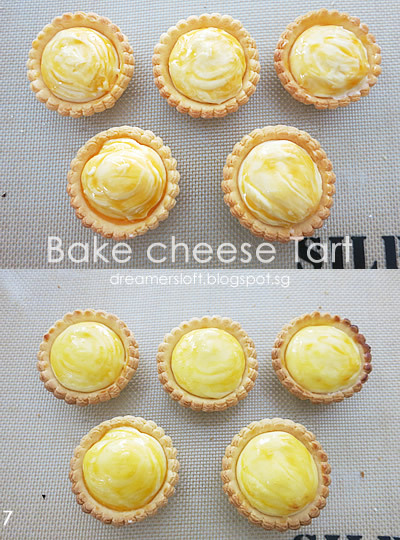 Instead, I prefer the BAKE Cheese Tart because of its size and perfect proportion of tart pastry to cheese custard. And so, went to Jiyugaoka again (Sept 2015), queued about 30mins and bought 2 tarts. 1 for immediate consumption and the other, for breakfast the next day. The aroma of the tarts filled the entire shop (the street even) and I could see why people were willing to queue for it. The tart pastry was fragrant and crunchy and the filling was really sharp, cheesy and gooey/creamy. I took one bite after another and in no time, one tart was gone. Almost wanted to eat the other one there and then. This was how the tart looked like after a day, chilled. Taste was still good, the cheese filling wasn't gooey anymore, but still very soft and fluffy, something like hanjuku cheese cake (which means 半熟 half-cooked, another popular type of cheese cake made by the Japanese). After coming home, I kept thinking about baking this tart and started searching on the internet for recipes and attempts by other bakers. Only found one written, but there are several videos done by folks from Hong Kong (here, here and here). 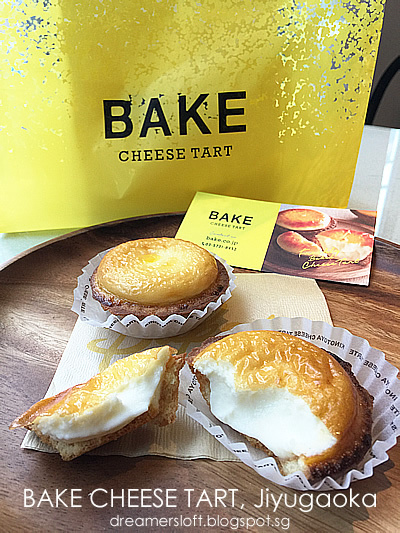 I think after the opening of BAKE Cheese Tart in Hong Kong, another bakery (in HK) also came up with a similar version, but call it lava cheese tart (流心蛋挞). So these videos are more of the lava cheese tart recipes. But I want the gooey type, not really the lava type. Doesn't matter, at least I have something to work on. 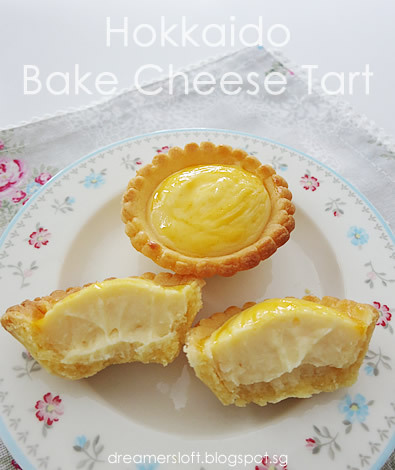 Based on the BAKE Cheese Tart website, 3 types of cream cheese are used, and I quote "Cheese from Hakodate in Hokkaido is distinctive for its mild flavor, while cheese made in Betsukai is full-bodied. We skillfully balance and blend these with a saltier French cheese." The tart pastry is twice-baked to make it more crunchy and delicious. There's no way I could get any Hokkaido cream cheese here, so I used Philadelphia cream cheese, mascarpone cheese, with parmesan cheese and salted butter, as well as fresh milk and egg. These are the ingredients I have on-hand and familiar with them. Feel free to try out other cheese combination. I think I will do that next time. 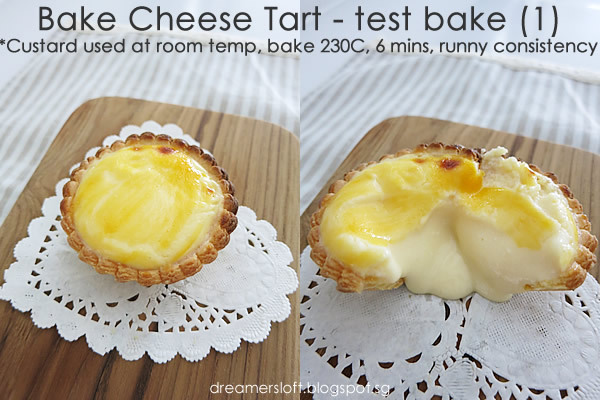 As for the method - twice-baked tart pastry and a cooked cheese custard (tried baking a cream cheese tart before using normal method, result wasn't the same). My first attempt was a disaster! By the time I started, it was afternoon. I was flustered and kind of rushing through, so yep. Never ever do test bakes when there's lack of time. 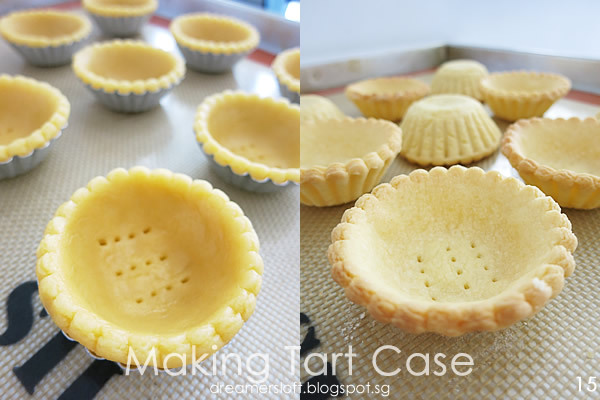 Baked tart cases for too long (180C, fan mode, 12 mins). Cooked cheese custard for too long, consistency too stiff. 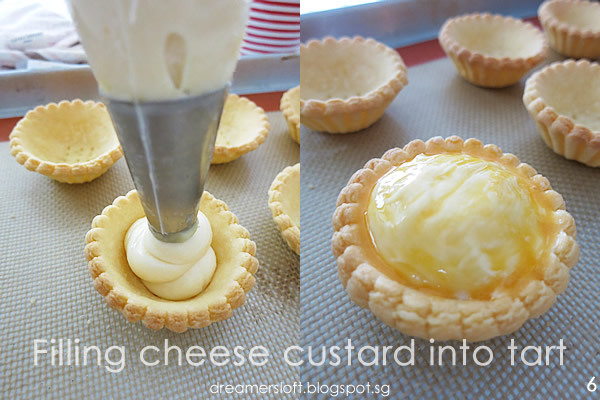 Piped too much cheese custard into each tart case. Baked cheese tart for too long (220C, fan mode, 10 mins). 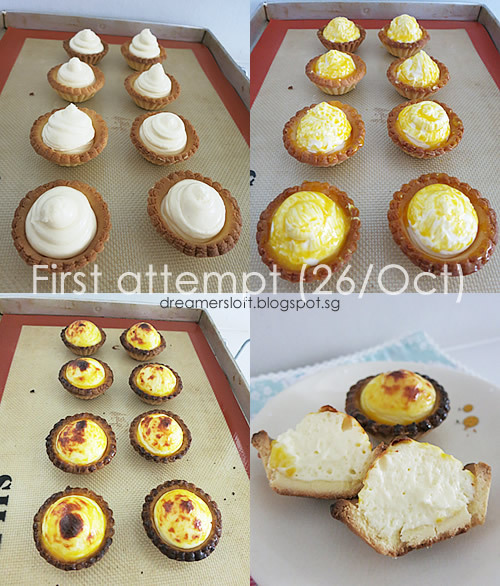 Baked all tarts at one go, instead of trying one by one for correct temperature and timing. Proportion of ingredients used slightly different, cheese taste not sharp enough. Well, the tart was burnt, the cheese filling was kind of mushy and not the gooey consistency I wanted. My son actually liked it (he likes anything cheesy, no pun intended), but I only let him try a bite; I ate one and the rest went into the bin. Ok, tried again yesterday. Woke up bright and early, completed some chores and started at 9am. By the time the test-bake was completed, it was 3pm!! But super happy coz finally successful after 4 attempts! 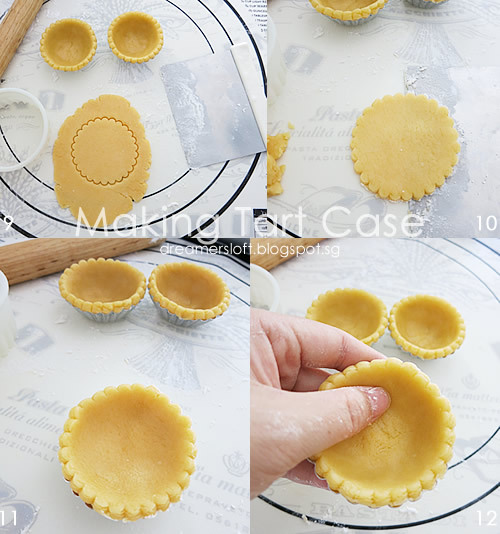 I had made 9 tart cases, test-bake first 4 piece by piece to get the right consistency, at the right temperature and timing, and in between made adjustment to the cheese custard as well. Don't know how to take video, so here are some photos and step-by-step guide. The explanations are very detailed so please skip this part and go right to the end for a more concise recipe if preferred. 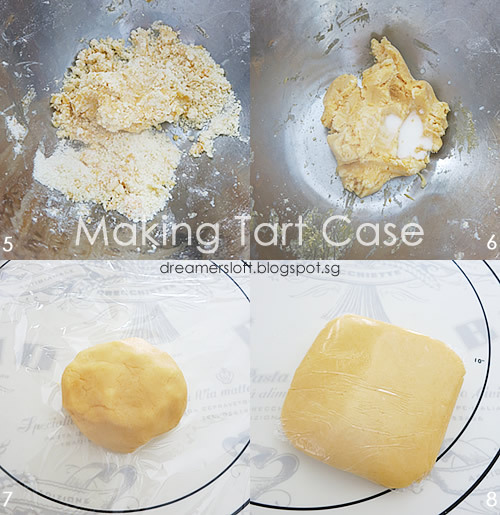 Start by making the tart case/pastry. I'm using a previous recipe which worked very well for me. 1. First, sift cake flour and icing sugar into a large bowl. Add cold salted butter cubes. 2. Using finger tips, break the butter and rub the butter into the flour mixture, until it resembles bread crumbs. 3. Add an egg yolk to the mixture. 4. Use a scrapper to mix the egg yolk. 5. The mixture will come together and thereafter, use the hands to form the mixture into a dough. 6. Add fresh milk, the dough will become very soft and pliable. 7. Knead the dough gently into a ball. Place on a piece of clingwrap. 8. Wrap the dough and place in fridge to rest for about 1 hour. 9. After 1 hour, remove the dough from fridge. Dust a baking mat (and rolling pin) with flour, roll the dough thinly, about 3-4 mm thickness. Use a 7cm fluted cutter to stamp the dough. 10. Use a metal scrapper (dust with flour) to lift up the cut dough. 11. Place the cut dough over a tart tin (5.5cm top/3cm base) and gently press it downwards. 12. Using finger tips, gently press and mold the dough into the tart tin. 13. Manage to yield 9 tart cases (previous time was 10 because this time the dough was rolled thicker). Use a fork to poke holes at the base of the tart cases. 14. 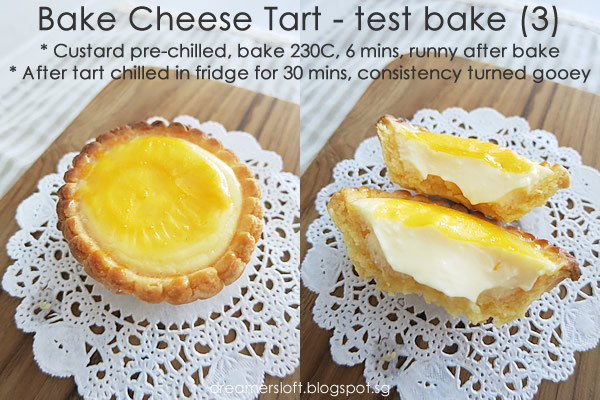 Bake the tarts at 180C, fan mode for 10mins. 15. The tarts will be very slightly browned, but cooked already. After the tart cases are cooled slightly, remove them from the tins and let cool completely before use. Next up, cooking the cheese custard. 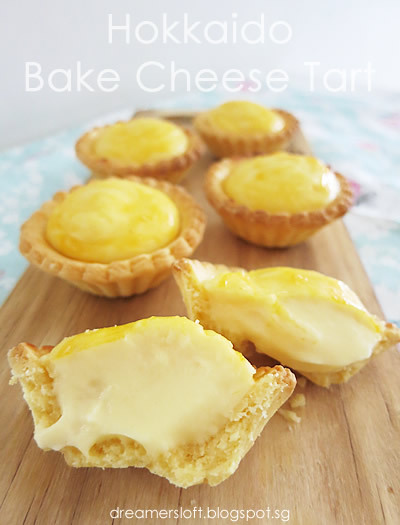 I realised that how the cheese tart turns out (whether runny or gooey consistency) depends very much on the custard. Although baking temperature and time could be used as variables to determine the consistency of the filling, it's harder to control. I'd rather control using the custard right from the start. 1. Add cream cheese, mascarpone cheese, parmesan cheese, fresh milk and salted butter into a small pot. Place the pot into a large, shallow pan/pot (I use wok) with barely simmering water. This is the bain marie method, to create a gentle and uniform heat for cooking custard. Keep stirring the mixture till everything is melted. 2. Once the mixture has melted, add sifted corn starch and icing sugar. Mix till well-blended, the mixture will thicken slowly. 3. Add full egg, vanilla extract and lemon juice. Mix till well-blended, the mixture will further thicken into custard. Taste the custard and if desired, add some sea salt to increase intensity of cheese taste. 4. There may be still some fine lumps and grainy bits in the custard, sifting will yield a more velvety smooth custard. This is optional. 5A. Now, after sifting, this is the consistency of the custard. It's still quite runny. When I lift the spatula and draw patterns, the patterns are visible but disappears soon. 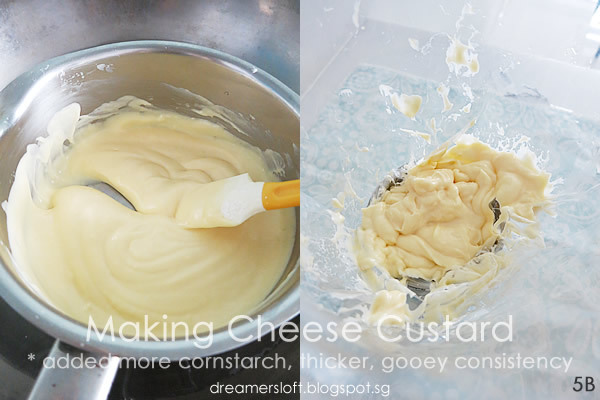 ** At first, I added about 8g of corn starch and stop cooking the custard when the consistency is still runny. ** This consistency of custard will yield cheese tarts that are lava-like. 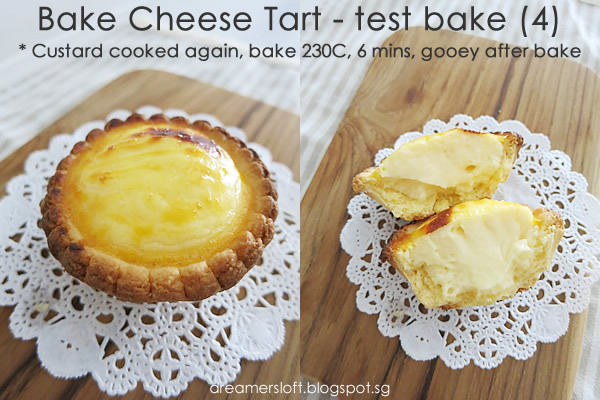 Using the cheese custard cooked with lesser corn starch and more runny consistency (5A), I filled 1 tart, brush top with egg yolk and baked it at 230C, fan-mode for 6 mins (realised that the key is to bake at high temperature, short timing). The filling turned out lava-like, which is what the Hong Kong folks baked. Initially I thought it was the temperature and timing that affected the tart. I even pre-chilled the custard before baking (to set it). This time, I baked at 235C, fan mode for 5 mins. Tart browned much too fast and I had to stop baking at 5 mins. Still runny, lava consistency for the cheese filling. Once again, I pre-chilled the custard, back to 230C, fan mode for 6 mins. After removing the tart from the oven, I knew (from the wobbly look and surface) it was going to be the same runny filling as (1) and (2). So I pop the baked tart into the fridge for 30 mins just for testing. Surprise, surprise, the consistency of the filling turned gooey, instead of runny! But but, I wanted it to be gooey straight from the oven when it's warm, not chilled! So by now, I realised it could be the custard after all. 5B. So, I returned the custard back to the small pot and started cooking it bain marie again. Added about 2-3g more of corn starch and cooked the custard to a thicker consistency. When I draw line across the custard, it parts and joins back very very slowly. ** So total amount of corn starch is about 10-11g and custard is cooked longer, but not too long until it turns stiff. If too stiff, the cheese filling will not be gooey anymore, just soft. 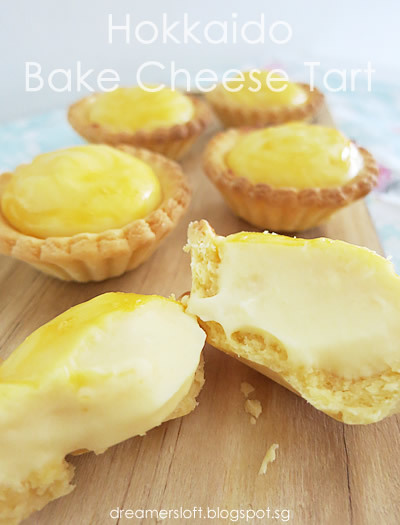 ** This consistency of custard will yield cheese tarts that are gooey-like. ** This is the consistency I am looking for, like the Japanese one! 6. So once again, I filled the cheese filling into the tart. The filling is firmer, can be piped more dome-shape (unlike previous version 5A, the filling shape is flat). (Based on the original website, the photos also show the cheese custard to be on the firmer side). Brush the top of the cheese tart with egg yolk. Baked the tart at 230C fan mode for 6 mins. (Key is to heat at high temperature, short timing). When I cut the tart into half, I heaved a sigh of relief, FINALLY! The exact gooey consistency I wanted =D The cheese custard was so smooth and creamy, yippee! 7. Being confident enough, I filled the remaining tart cases with cheese filling, and sent them into the oven, bake at 230C, fan mode for 6-7 mins. During the last 2mins, must watch the tarts very closely, because if they get burnt, it's a very quick split second process. While waiting, prepare the cheese custard. Add cream cheese, mascarpone cheese, parmesan cheese, fresh milk and salted butter into a small pot. Place the pot into a large, shallow pan/pot with barely simmering water. This is the bain marie method, to create a gentle and uniform heat for cooking custard. Keep stirring the mixture till everything is melted. Once the mixture has melted, add sifted corn starch (amount depends on final consistency of custard desired) and icing sugar. Mix till well-blended, the mixture will thicken slowly. Back to the tart pastry. Remove the dough from fridge. Dust a baking mat (and rolling pin) with flour, roll the dough thinly, about 3-4 mm thickness. Use a 7cm fluted cutter to stamp the dough. Place the cut dough over a tart tin (5.5cm top/3cm base) and gently press it downwards. Bake the tarts at 180C, fan mode for 10mins. Remove from oven and place on wire rack to cool After the tart cases are cooled slightly, remove them from the tins and let cool completely before use. Update: Left 2 tarts overnight in an air-tight box, tart pastry turned a bit soft, not crunchy anymore (probably due to humidity and moisture from the cheese filling), but the cheese filling remained gooey and creamy. Simply pop the tarts into the oven for a few minutes, it will turn crunchy again, and the cheese is still creamy. Thanks so much for sharing! I made it today and it was great success! I could nott believe the result! It was gooey & creamy, exactly the same as your pictures. Thanks so much for this detailed information. I made it today and it was so good! Gooey & creamy, just like you beautiful pictures! Hi, can I ask you for some advise before I start baking the gooey cheese tart. 1. Does the tart shell need to be fridged after molding? My attempt with other recipe (running cheese tart) the tart skin shrinked half way baking. 2. Do I need to bake the shell with baking weight? 3. When brushing the egg yoke onto the cheese filling, does it stay as a layer on top or it just dissolved into the cheese? 1. I didn't chill my tart shell after molding. The tart skin didn't shrink during baking. 2. I also didn't bake the shell with baking weight. Remember to poke a few holes at the base before baking. 3. The yolk mostly stay on top as a layer, not much dissolved. Thank you for sharing a great recipe and demonstration. I am about to do this gooey cheese tart. I have a question regarding the cheese filling. Do you put the cheese filling in the fridge before you fill in the tart pastry? I've not tried only 1 type of cheese yet. From the Baked Cheese Tart website, it was mentioned that 3 types of cream cheese are used, I think 2 from Hokkaido and 1 French. When I was searching the internet and youtube for recipes, a lot of them use cream cheese, mascarpone cheese and parmesan cheese, and some added milk, whipping cream, butter etc. I happen to have cream cheese, mascarpone and parmesan in my fridge so I just used these. I wish I could get hold of some Hokkaido cream cheese! hello! the temperature stated (230C) is in celcius or fahrenheit? They each have slightly different texture. such a great recipe, thanks for sharing! All temperatures stated are in Celsius. 1. If the cheese filling is well-cooked to the exact consistency, it will not shrink and flatten. 2. I didn't add cream of tartar. It's like cooking custard method, till thick and gooey. 3. The mushy texture initially was because I didn't cook the filling till correct texture. Thank you! Amazingly good! Tried this recipe with some adjustments and using my tart base recipe ;) thank you for sharing your steps to getting it to perfection ! Glad to hear that your tarts turned out well! hi, i need some advice for how long would u take when cooking custard on stove? thanks before! hi, thankyou for wonderful sharing. did u cook on stove while the whole mixing custard process? thanks! hi, could u help me figure it out why my cheese filling wont melt down like cream texture when i cracked it, instead its more like stiff but gooey when you eat. do u hv any tips while heating the cheese mixture? thanks for sharing btw! I'm not sure what you meant by the filling won't melt down like cream texture. What type of cheeses did you use? If the cheeses are too stiff, perhaps using softer cheeses or more milk? Yes the cheese filling/custard is cooked on stove. I didn't time how long I cook the custard, I just keep cooking till the exact consistency desired. Basically, the custard will get thicker and thicker the longer you cook. Stop cooking the moment the custard reaches the exact consistency you like the tart filling to be. Great post! Such dedication towards the cheese tarts hehe! Thanks for your recipe, just tried today and it's yummy! If I need to reheat, at what temperature and for how Long? Will it make the cheese not molten? Hi, a question, do you know if i can use ricotta instead of mascarpone? When i tried making another recipe of cheese tarts, using 100gr cream cheese, 100gr ricotta and 25gr parmesan, the parmesan smelled and tasted too strong (i don't know is it the ricotta or parmesan though) and its not gooey enough. Thanks. I actually used my air fryer, about 130-150 degree celsius for 5 - 10 mins (depending on whether directly from fridge or room temperature). The cheese might not be molten anymore, just gooey. Sorry, I'm not so familiar with ricotta cheese. The texture seems to be stiffer than mascarpone cheese though. If you find the parmesan taste too strong, you could reduce the amount. And if the cheese filling seems too stiff, add more milk, bit by bit to achieve the consistency you like. You are my hero. Thank you for sharing this ! I tasted Bake tart one year ago in Shinjuku and that was the best cheese cake I ever tasted. But I live in France (sorry for my bad english) and won't go back to Japan until years... Thank to you, I know I can taste this delicious cake again now ! Just tried it yesterday! It was a success. Thanks for sharing your guide. By the way, any other cheese you would recommend for the filling? If you like very strong cheese taste, can go for sharp cheese. I would combine with creamy ones to make the filling smoother too. The milk is in gram. Hi, would like to clarify the amount of ingredients you stated in the recipe. For the tart pastry, is it 1/2 teaspoon milk? For the custard, 1 tablespoon lemon juice? tsp is short form for teaspoon and tbsp is short for tablespoon. Hi thank you for your great recipe! I am planning to make it tomorrow but was wondering if I could make the cheese filling tonight and leave it over night in the fridge before using it tomorrow? Yes, I have tried making the cheese filling a day ahead. The next day, just bring the filling close to room temperature (take it out from fridge to thaw for 20-30 mins) before piping. You can check out my post on that. Baked it, loved it! Thank you for your labor of love and for sharing it! My family felt there was too much lemon which I didn't mind, but next time I will put in 1 tsp for their sake. Also maybe just refrigerate the dough for 30 mins as 1 hour was a little hard and I had to soften with heat from hand. Thanks again, daydreamer! Keep dreaming! I have problem on the tart dough after take out from fridge. It too soft to handle n shape to my tart mould, it will break off..
Glad that you have tried baking the tarts with success! Try dusting with more flour to help. 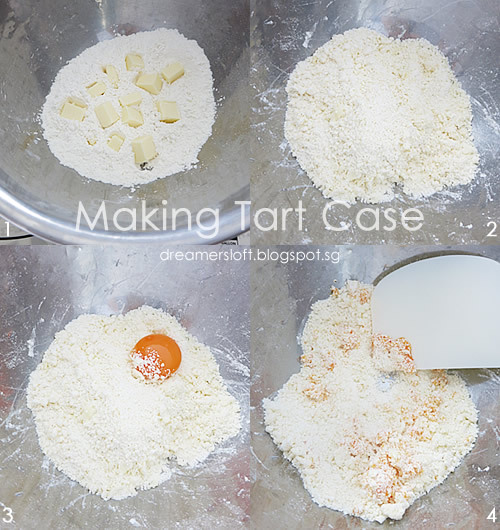 Alternatively, instead of using a cutter, just take some dough and mold it into the tart case directly. Thanks for informing. Yes, Michelin Guide SG approached me previously and asked if I would like to feature my recipe and photos on their website which I agreed. So far, this is the only website that I gave consent to, if you see my recipe and photos on other websites, please do let me know! Hi, my oven is not fan mode. How should I adjust the temperature and cooking time? Thanks for your recipe. I tried it yesterday, and the result is quite good. However, the parmesan taste a bit overpowering, i think i will just replace it with more mascarpone cheese next time. Hi, thanks for the detailed instructions! They really helped! I attempted these today but upon cooling, the tops started to wrinkle. How do I get a smooth and shiny top without the wrinkles? Suggest that you try varying temperatures and timings as different ovens are slightly different. Hmmm, I've not experienced wrinkling of the surface of the tart before. But the ones I bought in Tokyo did have wrinkles on the top. I think it could be due to difference in temperature/humidity after the tarts are taken out from the oven (very hot to cold/dry). May I check if you are in SG? Or after taking out from oven, cool down is in air-con room? Probably can try cooling down the tarts in the oven instead of outside. Hello, I just tried your recipe. It tastes great! But I think we did sth wrong with the custard, after baking instead of smooth and goey it looks broken- like split whipped cream texture. After the cheeses next in the mixture, is it supposed to be kept over the heat while adding corn starch and the rest? Or taken off the heat? hi may i know the dough need to put in freezer compartment or just in the fridge? and another question is , when cooking the cream cheese, need to use double boil or direct on the stove method? The cheese filling is supposed to be cooked using double-boiler method until ready (i.e. add the cheeses, milk and butter, cook till melted. Then add sifted corn starch and icing sugar. Mix till well-blended, the mixture will thicken slowly. Finally add full egg, vanilla extract and lemon juice. Mix till well-blended, the mixture will further thicken into custard. Taste the custard and if desired, add some sea salt to increase intensity of cheese taste. After this step, then remove from heat. If you intend to use the dough on the same day, just chill in the fridge. If intend to keep for future use (up to 1 month), in the freezer. 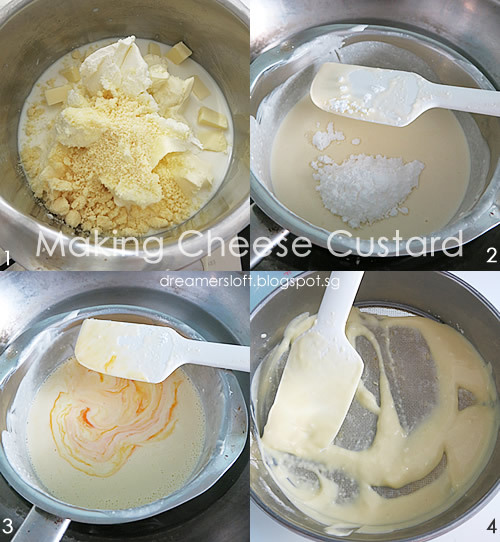 When cooking the cheese filling, pls use the double boil method for more even heat distribution and the custard to cook nicely. hi i am trying the recipe now it is pretty tricky though. But it turned out ok just one question is how come the custard is really runny though even though i followed every step 100 percent? If you have followed the ingredients, then it should thicken into custard. Just keep stirring (with the bain marie method) and eventually it will thicken, it may take some time. If really cannot, try adding a little bit more cornstarch. The cheese tart looks delicious. Going to Ipoh to get it next weekend. Can I use other than parmesan cheese? 1) which size of nozzle did you use to pipe in your filling into your tart shell? 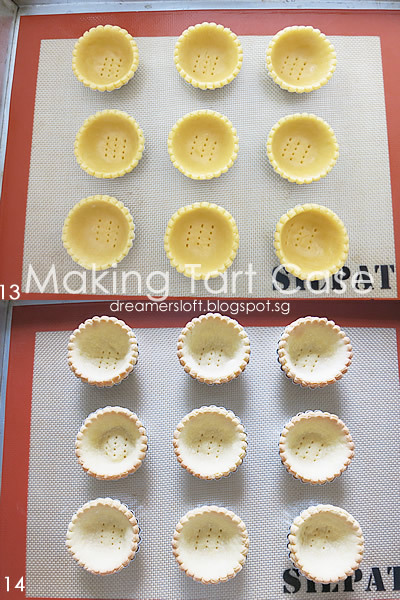 2) after baking your tart shells, did you unmould them before piping in the filling? 3) if you did unmould the tart shells before piping the filling, did you put them back to the mould and rebake them with the filling? 4) do you think I can pre-bake the tart shells 48hours and store it aside in readiness for piping in the filling? Yes, parmesan cheese can be replaced by other cheeses or omitted, it is not the main cheese component. 1) I used a Wilton 803 piping tip. Actually it's not necessary to use piping tip, sometimes I just cut hole accordingly based on size of my tart cases. 2) Yes, I unmoulded the tart shells to cool down, and for piping the filling. 3) No, the tart moulds are not used anymore after the blind bake. 4) Should be ok, the main concern would be the tart shells turning soft due to our humid weather. But since will be baking a second time with the filling, should be ok. Do store in airtight container. 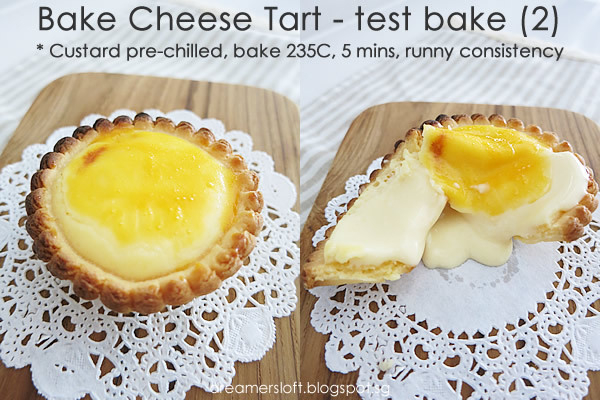 The tart is heavenly and the cheese filling is very close to the original in my opinion. However, the tart crust is not as solid and hard as the original (BAKE) one. The crust produced by your recipe is the typical "Egg tart" crust, a little bit on the crumbly side. The type of crust that i'm referring to is along the type of "Fruit Tart" by Fruit Paradise (https://fruitparadise.com.sg/). I think they are called shortbread crust and from what i see on the internet, the ingredients is largely the same as yours. So what am i missing? What do you think i can do differently to produce a stiffer crust? Bake longer? Do let me know your insight! Theres no parmesan and mascarpone cheese on my city. May i replace with chedar cheese or skip it? You can just replace with more cream cheese. Can also add some cheddar cheese for richer taste. Explore with cheeses that are available, but the base must have cream cheese and milk. Thanks so much for replying to my queries. I have the following last three queries before I start to attempt your recipe, would be really grateful if you could help. 1. What is the heat on the stove when you double boiled your custards, ie. Low, medium or high heat? 2. 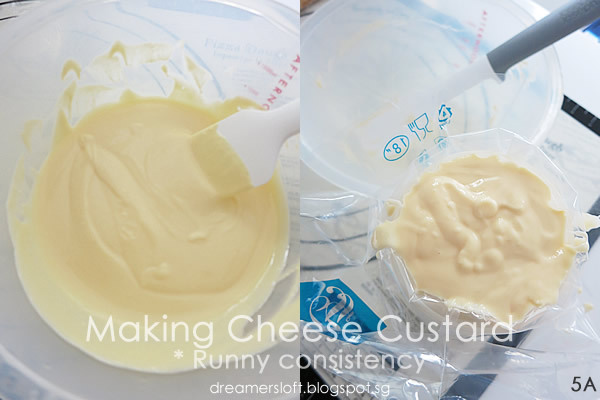 Approximately how long did you double boiled your custard for the gooey custard texture filling when you cooked your custards (the one with 11g the consistency like the Japanese one)? 3. With this recipe, can I just double all your ingredients just to yield 20 tarts (my tarts moulds are almost the same size as yours)? 1. After the water starts to boil, I turn heat to low, so water is barely simmering. 2. Yesterday I attempted recipe part IV (half recipe), it took me almost 23-24mins. It depends on the amount of custard. 3. For this recipe part I, I think double may not be enough, may need 1.2 time or even more, depending on thickness of the dough you are rolling. I tried your method yesterday. But I reckon I baked it a little longer because the yolk layer didn't turn into skin-texture. I willbtry fan mode 230deg. Thanks for the beautiful recipe. I try not to keep the cheese filling for more than 3 days as cheese tend to spoil easily. You are most welcome! Try varying the oven temperature and baking times because different ovens turn out differently. hi. i dont have a fan mode oven. can i use conventional heating top and bottom instead? any suggestion on the temperature and duration of baking? Yes, I have tried 230-235 degree top bottom heat 8-10 mins too. Works fine, just keep watch towards the end and adjust timing accordingly. Today I made a batch of HBCT using your recipe. They turned out superb. Thank you very much for sharing the recipe. Hi Meg!! Omg i'm so glad i found this blog!! Such a detailed information and thank you for sharing all your test and trial processes. That would be very very helpful. Can't wait to try and make the cheese tart this weekend. Hi, thank you for sharing this recipe. Sometimes I use this recipe and taste too eggy. But most of the time, it tastes very good. Based on your experience, how could this happen? FYI, I never use lemon juice in my custard because it priced too expensive. Maybe the freshness of eggs or the size (too much yolks)? Probably you can add some vanilla extract to the custard. You can just calculate by percentage. Since 250g is about 65% more, so you can try 65% more for other ingredients as well. Hi, I would love to try your recipe. Is it ok if I omit the constarch in the recipe? And about the oven, mine is not fan mode, I research some conversion temperature and says that I have to add 10-20 degrees to the recommended temperature of fan mode oven. So I guess I'll try to bake it around 240 degrees celsius in 6 minutes?? I am afraid that it might turn out bad. Cornstarch helps to thicken the cheese custard so I won't recommend omitting it. As for the oven, yes you can use conventional. I've tested in some of my additional recipes parts ii, iii, iv. Hi, can I use plain flour instead of cake flour? What will be the effect on the tart? Yes, plain flour (all purpose flour) can be used. In fact, I've been using plain flour now. The tart will turn out slightly more crunchy. One of the best recipe, today I tried making it at home and tart made was so creamy and tasty. Though, It was not as beautiful as yours but was very delicious my friends loved it. Thanks for trying my recipe! Glad that it turns out well for you :) Happy baking! Thank you so much!! I have an original recipe from my friend in Tokyo and yours is almost exact!! I didn't get a tart recipe from him for the base so I'm excited to try your recipe!!! Will come back and let you know my results. If you would like my recipe, I'm happy to share it with you!! Thanks again. 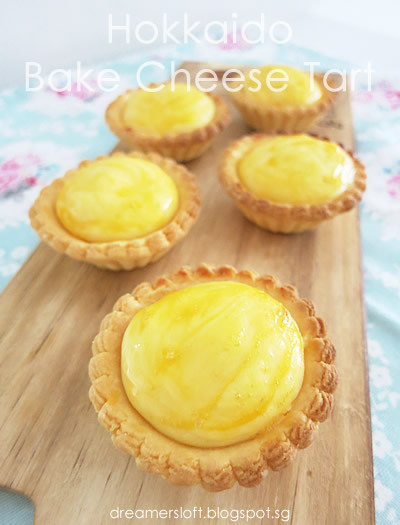 Have fun with the cheese tart making! Hi, I tried making the cheese custard and the consistency is goey before I added the whole egg. After I added the egg the consistency becomes runny. Is it because I let the mixture cool down before I add the egg ? Does the mixture has to stay in bain marie when I added the egg? Hi, yes the custard will turn runny after adding the egg, just keep cooking, it will turn gooey again. Yes, stay in Bain Marie, till custard is done. Superb work, cheese tarts looks so delicious. The way you have presented the steps of making cheese tart has made it looks very easy to make recipe. Thanks for sharing it. Hi, I am looking forward so much to baking these cheesecakes!! 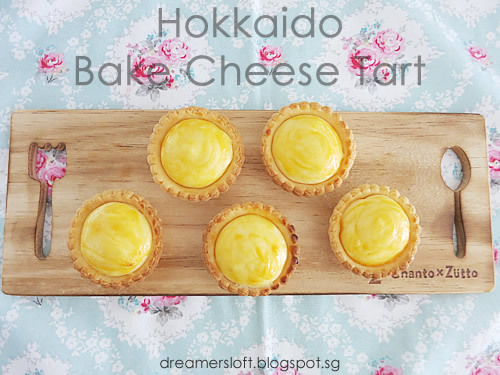 I think Bake Hokkaido cheesecake is the best in the world! One question: Is the Parmesan cheese the real old one from France or a milder version? Thank you very much! Just the normal parmesan cheese will do.